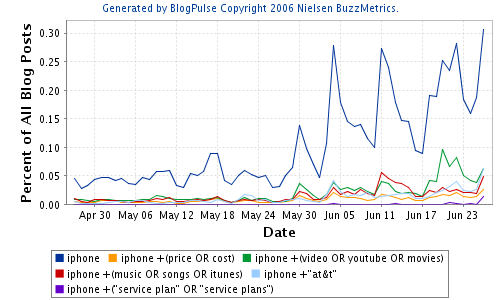 According to BlogPulse, buzz around the iPad announcement (peaking at 1.75% of blog posts) was greater than that around the iPhone announcement(which peaked at a little over 1.5%). 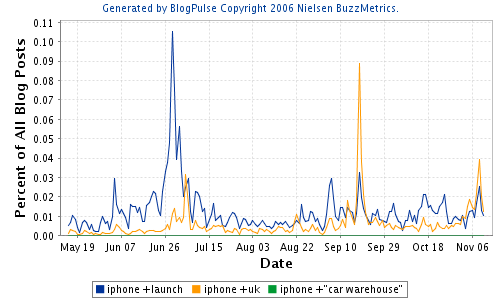 If launch day buzz follows the iPhone pattern it will come it at less than the announcement buzz. I use an app to check on the skiing conditions at local slopes. I click on the icon on the iPhone, the app pops up and I see some data. When I'm on a desktop, I do exactly the same thing, except the app I click on is a web page. While Apple claims 140, 000+ apps available for their phone, and others in the space do the same, a good number of these apps are really just thin clients backed by the same sort of data that usually goes to populating a web page. This prompts an obvious question: how many 'apps' are really just thin clients backed by web servers similar to those for traditional browsers? An initial answer to this might be constructed out of a break down of app categories (games, for example, are less likely to fit this model). In addition, as we hear more and more about crawling the deep web, what are the rules of engagement for crawling the data services that back these thin client, browser-like apps? So I finally bought an iPhone. While I have much to say about the realities of the interface, I’m currently enjoying the irony of my favourite application being the PRI radio application. This is a simple radio streaming app for PRI/NPR stations. So I’m listening to content intended to be broadcast wirelessly by getting it digitized, stream the data over a wireless network and then turning them in to sounds. The content is also programmed. Some people will do anything to listen to the BBC. Journalists and PR minders outnumbered buyers on Friday night as interest in Apple's iPhone miserably failed to live up to the pre-launch hype in the UK. 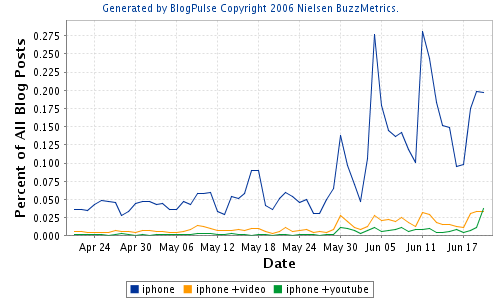 When the iPhone launched in the US, on June 29th - a Friday - the blogosphere generated 0.105 % attention (about 600 posts) for the query 'iphone +launch". On November the 9th - also a Friday - the UK launch produced 0.025% for the same query (about 160 posts). Given the difference in the size of the countries, this doesn't perhaps seem as stark as people are painting it. However, one would have to look deeper into the nature of these posts. Perhaps all the US buzz was full of swooning admiration whereas all the UK buzz is scoffing at the lack of buyers. It will be interesting to see how this story unfolds. There are many variations on the terms I've used below (for example, how many posts mention the Touch but not the iPhone price drop?) 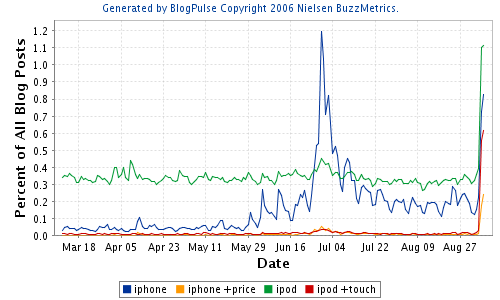 but from the below one might infer that the iPod Touch is getting more buzz than the negative iPhone price drop story. It is noteworthy that the buzz around the announcement of the iPhone exceeded that generated by the release (in terms of the peak of discussion). It seems that my prediction about buzz was pretty much on the money. iPhone buzz jumped to 1.4% yesterday (launch day). The thing is all over TechMeme and Tailrank. A new part of the story which I haven't read elsewhere yet is iPhone spam. I received an email with the text 'AT&T has activated X's new iPhone, the number is...' I'm not sure if this was generated via the set up process, or if it was hand rolled. The fact that it mentions AT&T suggests the former. It is probably worth pointing out the case for NLP in the context of buzz monitoring. How would you surface all the blog posts from people who now own an iPhone? A keyword approach is going to be inaccurate. 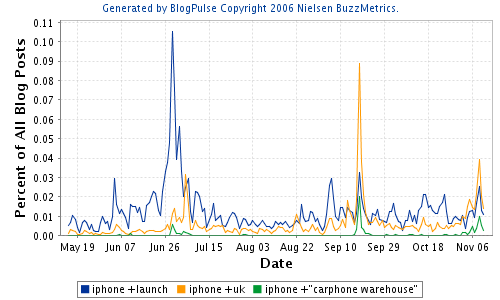 A few searches on Technorati for 'bought iphone' or 'my iphone' demonstrate this. Being able to pull out the type of relationships that Powerset talks about is the way to go. I notice that Cymfony has a position open for a computational linguist. It has been interesting to track the transformations both BuzzMetrics and Cymfony have undergone post acquisition (by TNS and Nielsen respectively). A cursory review of their websites suggests that Cymfony is racing ahead. Expect a deeper dive on this competition a little later on. Do you hear a ringing sound? As I suggested earlier, the iPhone launch is going to be a case study vehicle for social media anlaysts. Hey presto - BuzzMetrics put out a press release and will follow up with a web cast. In addition, they will be offering a syndicated report. 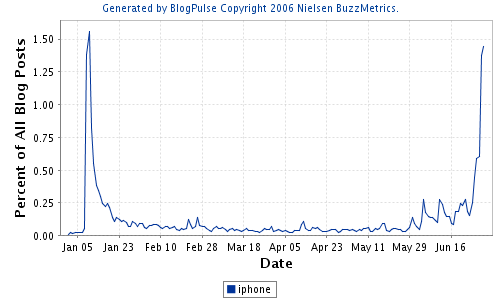 My prediction is that chatter in the blogosphere about the iPhone will hit 1% tomorrow. 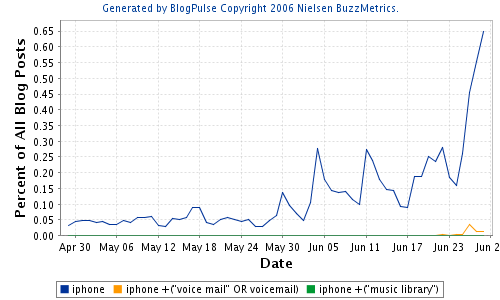 Update: Relevant Noise is also blogging about this from an analytics point of view, Max (BuzzMetrics), Pete (BuzzMetrics). iPhone: Video a Big Deal? While the iPhone is generating a Star Wars like anticipation in the real world, the online world is buzzing with discussion. The ad hoc analysis shown below suggests that the ability to play videos is a big deal among potential customers. iPhone the PS3 of Cell Phones? 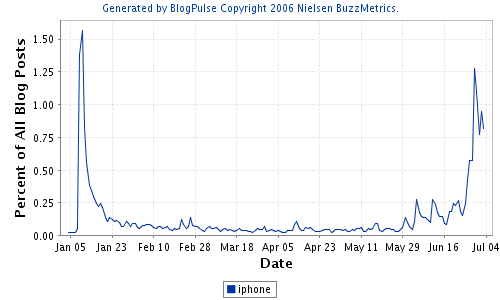 The iPhone is going to make a great case study for those interested in online chatter, buzz, hype and so on. Given the price, the fandom and the attention, one can't help but wonder if the iPhone is the PS3 of the cell phone industry: expensive, built in fan base, lack of units at launch, etc.